Jason McKittrick has bounced back from last week's unpleasantness, thwarting the attempt by eldritch forces to disrupt his work. 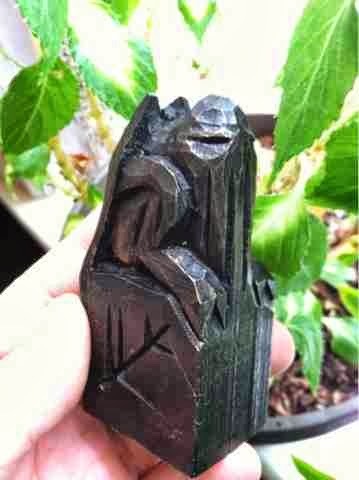 He returns with this wooden Cthulhu fetish, a limited run piece available only until the witching hour tonight. Phil Bolton brings us this recreation of De Vermis Mysteriis. The faux leather cover is made from a paper and PVA composite. Follow the link to browse through more shots of the tome and some of his other fine work. 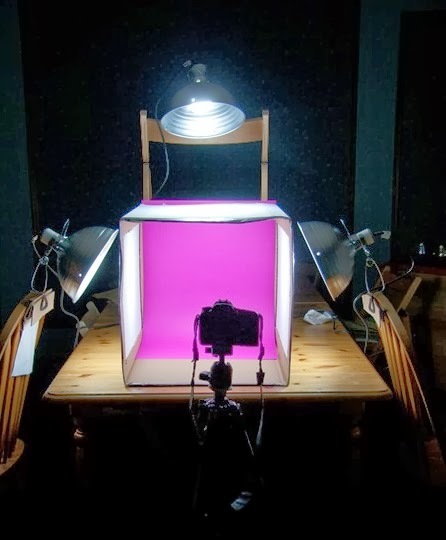 Even the most carefully crafted prop is going to look terrible if you can't get a good picture of it. I bring this up because I keep coming across items that look interesting, but the photographs illustrating them make the props look terrible. Getting good shots is a problem I've struggled with myself, so I wanted to draw your attention to this tutorial on creating a low-budget lightbox. You'll be amazed how the relatively small investment needed to put it together will pay off. 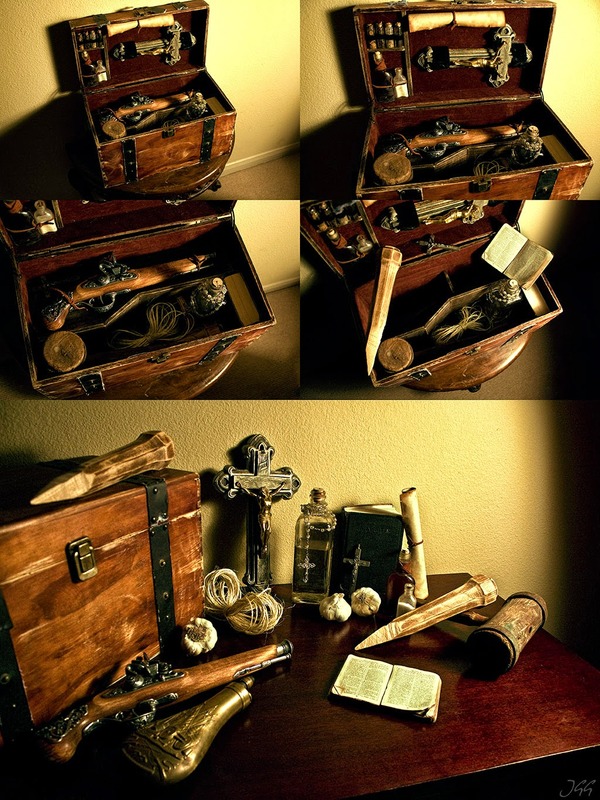 I use an almost identical setup for all of my prop pictures and it makes capturing good snapshots much easier. Last week's preserved fetus project would have been nearly impossible to photograph without one. The soft, even lighting brought out the details of the piece while keeping reflections from the shiny resin finish from washing out the image. VonMeer brings us this highly collectable stylized fishhook from Innsmouth. It's the kind of thing you'd find in a little out of the way antique shop. Josh Jay brings us a detailed build log for this incredible replica of the Brotherhood of Steel helmet from Fallout. 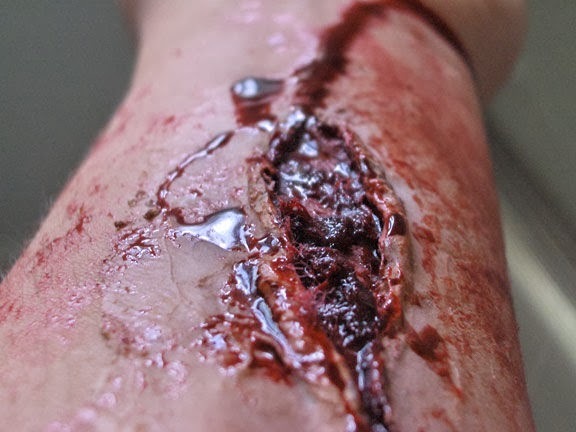 Robert Neamtiu brings us a handy instructable on creating wounds using latex and tissue paper. The tutorial uses makeup-grade liquid latex, but I would humbly suggest saving yourself a pile of money by using Capitol brand #017 Latex Seam Sealer instead. It's exactly the same thing. No, strike that. It's actually a better product since it includes a higher proportion of latex solids. I buy mine at Lowe's, but you should be able to find it at any big box home improvement store. Eden Bachelder brings us this Minion of Yig mask. 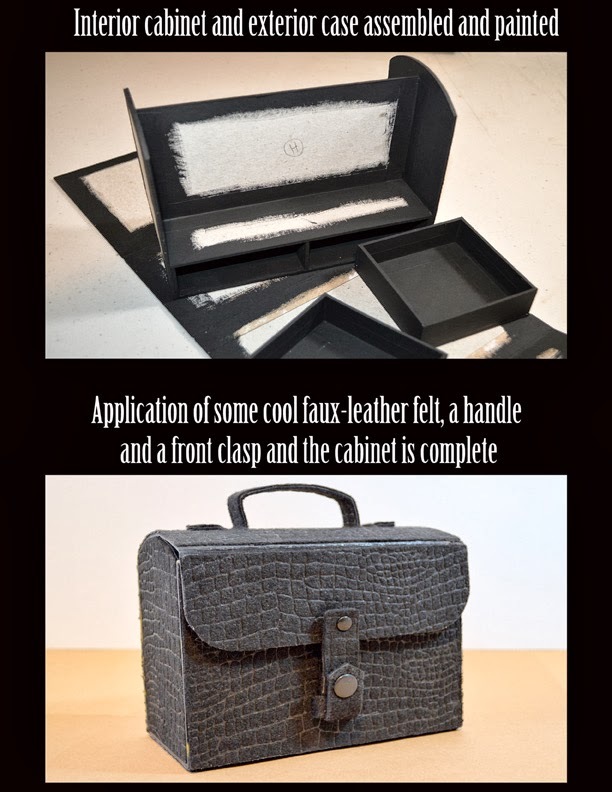 It's hand tooled from a single piece of leather and has a wonderfully worn crackle finish. I was saddened to find out that Jason McKittrick has been laid low. Hey everyone, this is Kristina McKittrick, Jason's. I just wanted to let you all know that Jason has been in the hospital suffering from pneumonia, flu and severe migraine headaches. He's definitely on the road to recovery but will be in the hospital until Friday. Needless to say, orders will be delayed for about a week. Once Jason is recovered he will get right back to fulfilling your orders. We truly apologize for the inconvenience and thank you for your patience. 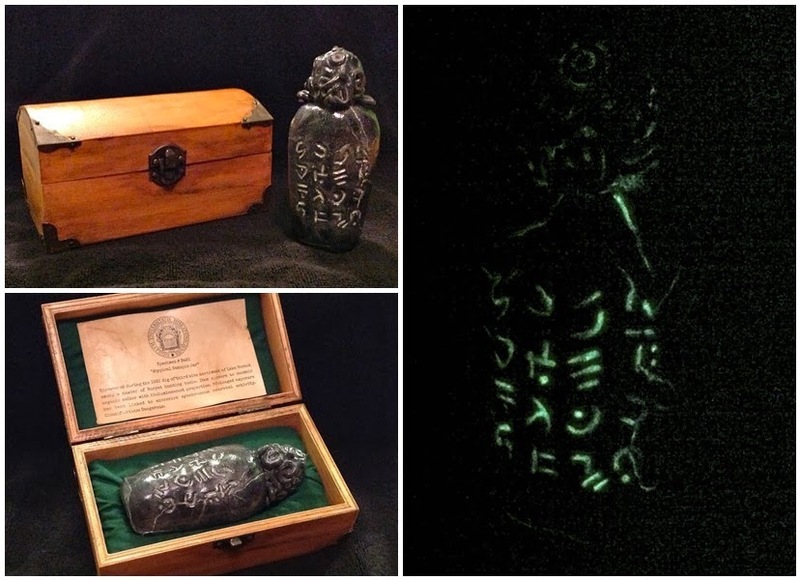 Jason has been one of the leading lights of the Lovecraftian prop community. I'm sure you share my wishes for his speedy recovery. 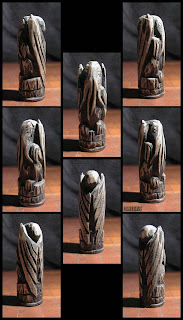 John Gormly brings us this hand carved wooden Cthulhu idol. I really like primitive figures like this. I'd be curious to see just how much you can simplify the form of Cthulhu and still have him be identifiable. 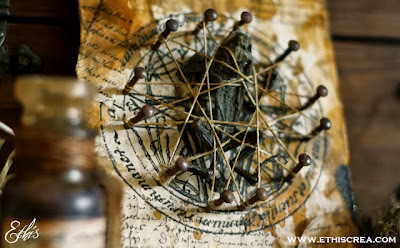 French artist Ethis brings us an excellent bit of spellcraft, part of a display within a cabinet of curiosities. I would strongly suggest stopping by his site and browsing through the rest of his work. 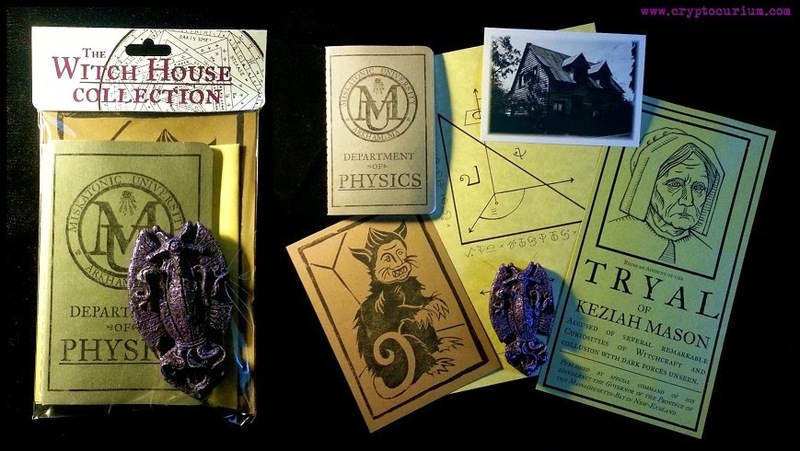 Jason McKittrick brings us this specimen from the Miskatonic archives. It's another of his short run projects for the month of October. 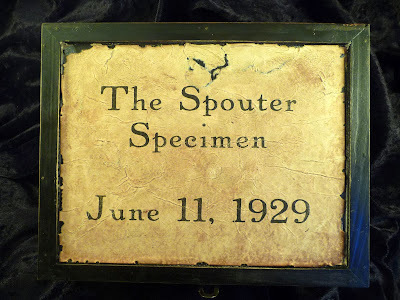 For over sixty years the Spouter Inn served the whalers that temporarily called the port of New Bedford, Massachusetts home. In addition to it's primary attraction of cheap lodging and drinks it also boasted an impressive collection of memorabilia collected by sailors from around the globe. 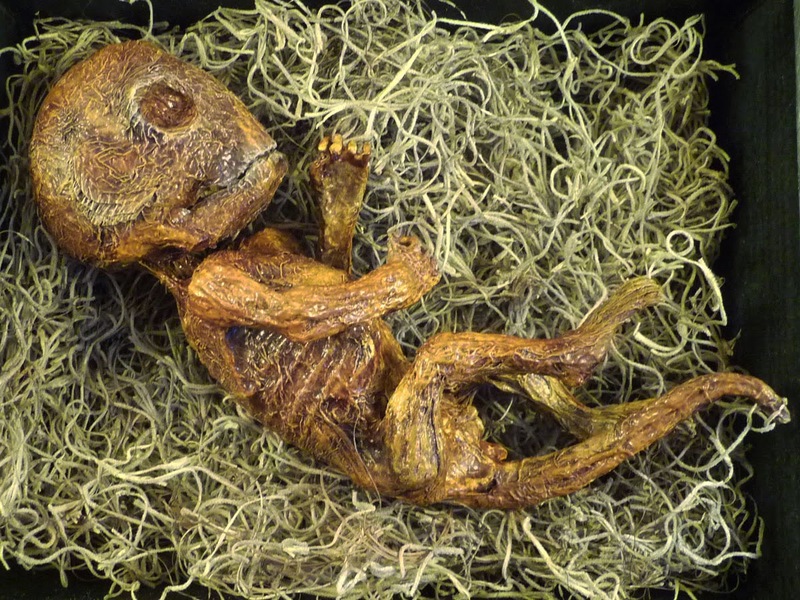 Mixed in with the blooded harpoons, whale teeth, and curious oil paintings were a few items of an earthier nature, including shrunken human heads from New Zealand and this curious specimen from the South Seas. It was reportedly owned, or at least in the possession of, a mate who'd served on the schooner Columbia during it's successful trading voyages into the Pacific. After a falling out with the ship's Captain he fled to New Bedford in search of the first ship that would take him. Desperate for money, he traded the odd creature with the Inn's owner in exchange for lodging. The deal would turn out to be all to the advantage of the innkeeper. Just two days later a reunion with his former shipmates would end tragically when he drunkenly stumbled off the pier and drowned. The creature would adorn the walls of the Spouter Inn until the early 1920s, when it came into the possession of a traveling sideshow. 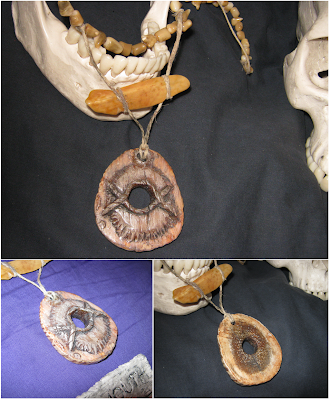 The specimen criss-crossed the country being exhibited to fair goers before being purchased by a private collector who recognized it's potential importance. 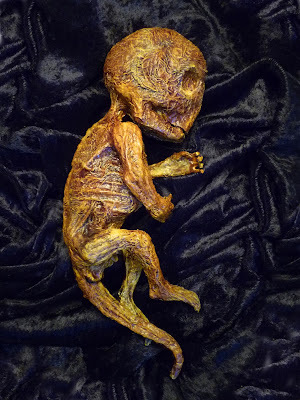 The creature is roughly 8 and a half inches in length and resembles a humanoid fetus or newborn equipped with a tail and what appear to be gills along the side of the head. 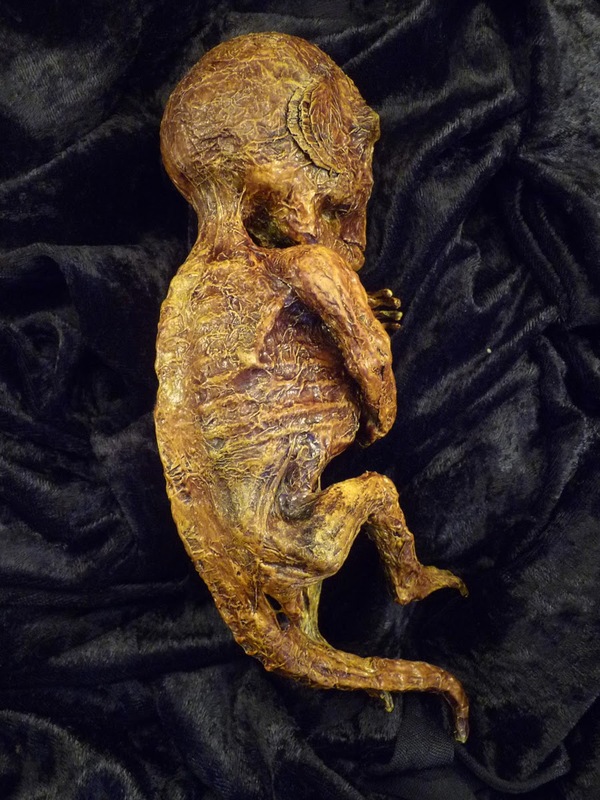 The body is encased in dried resin and shows signs of partial decomposition, but it's not clear if that occurred before or after it was preserved. This was another exercise in trying to produce a gaff that meets modern standards of presentation while using vintage-style techniques and materials. Compared to my previous efforts it shows a lot of improvement, both in the overall sculpt and the final finishing treatment. Most of that can be attributed to taking my time and really paying attention to anatomy. 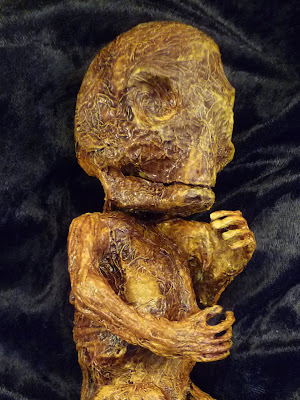 With a mummified figure you have a goodly amount of leeway in that area, particularly when you're working on something that's intentionally not human, but it's the first thing a viewer will notice. I still have a lot of room for improvement, but I'm happy with how the muscle structure came out. 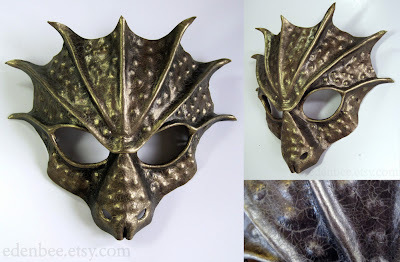 In terms of materials, everything you see is paper mache. The finish is ivory highlighted with off white and hand painted burnt sienna shadowing. That was followed up with a coat of traditional shellac and a spritz of matte finish to take the glossiness down to a more satin appearance. If you click through to the high resolution pictures you can get a better feel for the amount of texture work. 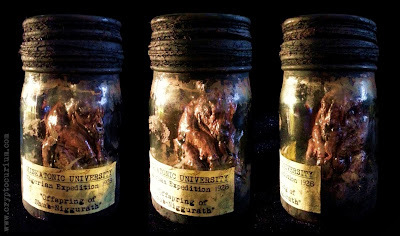 Despite making dozens of prop bottles with wax seals I've never given much thought to them. Press the cork to fit, dip the bottle top in molten wax, repeat until finished. Now Elmo Iscariot has sent over some material that's making me rethink how I approach those seals. I was just perusing a Wikimedia page with photos from the Arabia Steamboat Museum, in Kansas City, MO. The Arabia sunk in 1896 and settled under the mud in the riverbed. Over the next century the course of the river shifted, and eventually a team of archaeologists excavated the site. 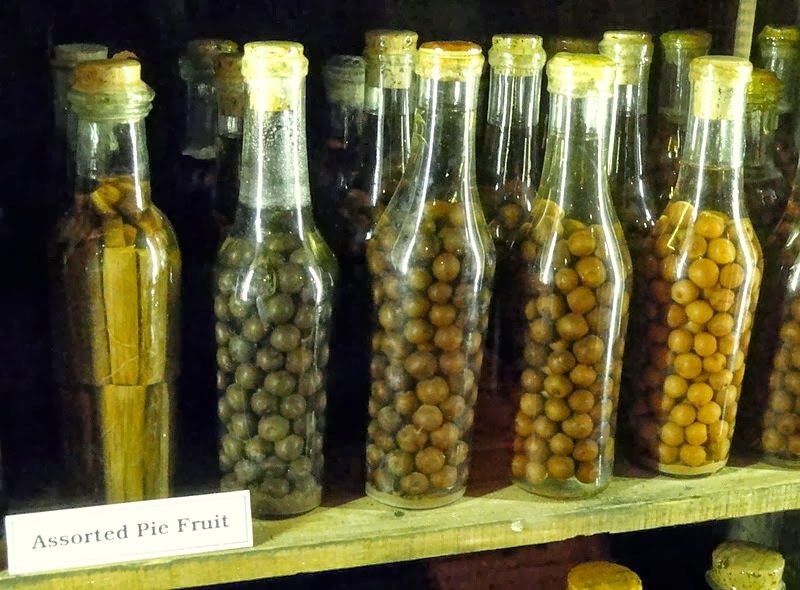 Because the ship was carrying commercial goods to the frontier, the museum is like a fully stocked mid-19th centurygeneral store. This is fascinating enough by itself, and there's probably plenty there of interest to propmakers, but one thing in particular made me think of you. 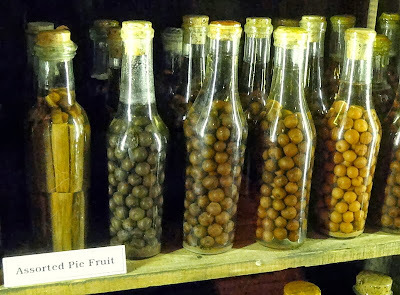 The bottles were all packed with their corked ends dipped in wax, so the contents are still intact, a century and a half later. Just look at that. 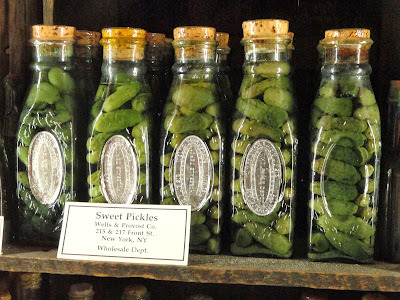 These things are over a hundred years old and they look like they were bottled yesterday. 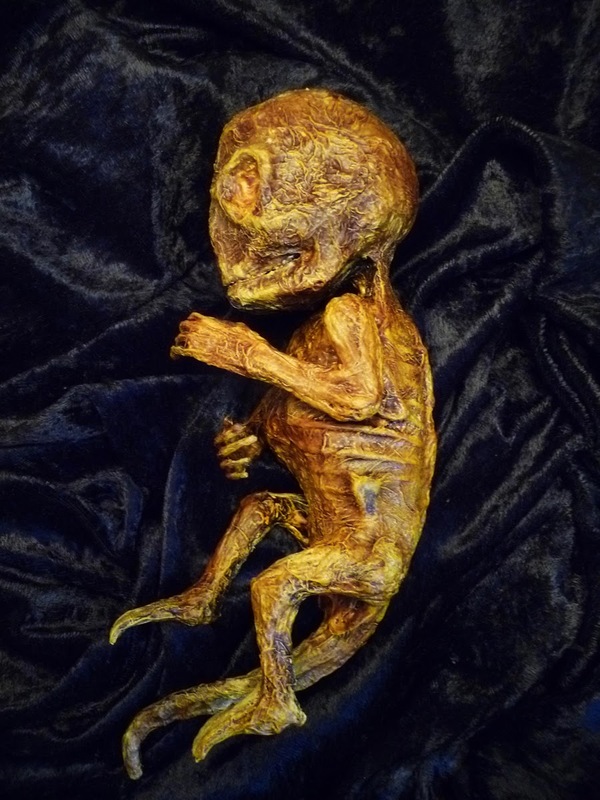 I'm sure being buried in an oxygen free environment helped, but the level of preservation is simply amazing. 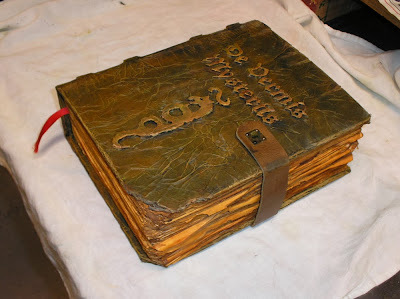 Note the wax seal- it's just a single layer. 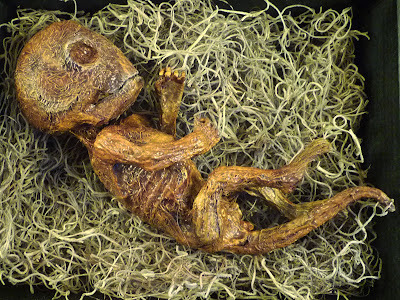 Again, they're amazingly preserved. You can also see the variation in the length of the wax seals from workers dipping the bottle tops. These are almost identical to some of the bottles I've used for prop specimens. There are two insights to be taken away from this particular picture. 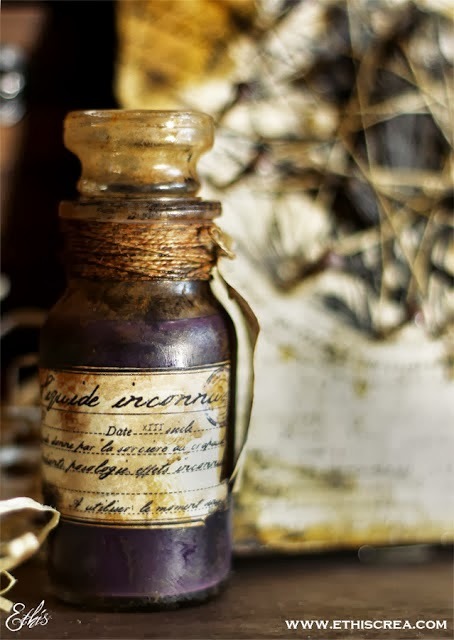 The first is, again, how rudimentary the wax seal on vintage bottles actually was. Instead of the great knobby bulbs I've been using the wax is a single thin layer. 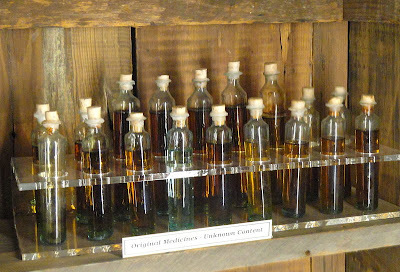 The thick buildup of wax present on many prop bottles may be appropriate for something crudely sealed at home, but professionally made items will have just enough wax to ensure an airtight seal. The second item of note is the lack of paper labels. They just don't hold up over time unless the bottle is in a protected environment free of moisture and light. That makes me feel a bit better about the heavy weathering I've been using on my labels. 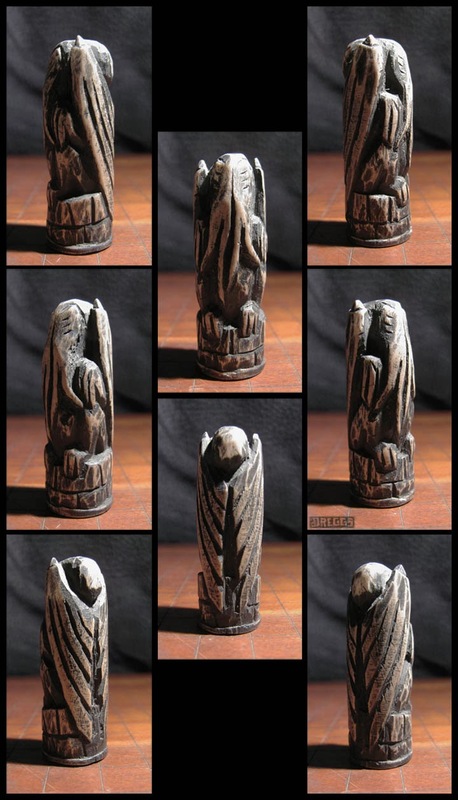 Copper Centipede returns to our pages with another carved Cthulhu idol. This one was made from basswood and features a well done monochrome finish. 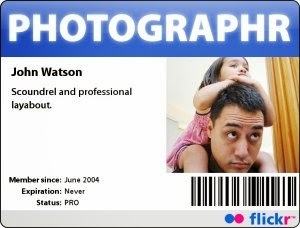 Big Huge Labs brings us this excellent little badge maker app. 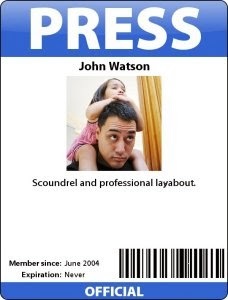 It's a quick and easy way to generate faux identification for costumes or LARPs. A few minutes to design a badge, a 50 cent laminating pouch from the office supply store, and you're good to go. Vonmeer brings us this intriguing pottery fragment. 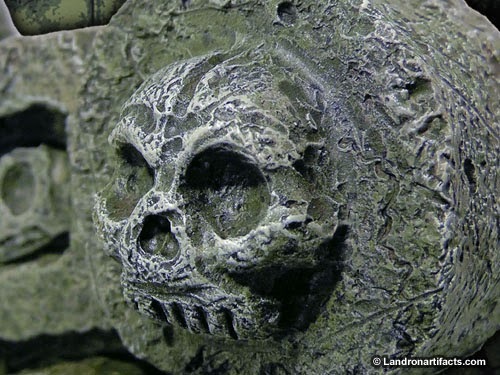 The bas relief sculpt is very well done. Helene brings us this unusual canopic jar from the shores of Lake Vostok. The polished stone finish looks great. Jason McKittrick continues his limited run projects with this collection based on Lovecraft's "Dreams in the Witch House". The concept of magic as mathematics is one of the most influential ideas the Old Gent came up with, but the importance of the story is frequently overlooked. Stuart Williams declares his allegiance to the Horde with this nicely done necklace. I've always been a sucker for metallic highlights on black. A perusal of the archives will show that I've been interested in faux creatures and specimens for some time, but it's only the last year or so that I've actively been researching their history. The majority of the available material on the subject concentrates on two areas. The first is cryptozoology, where manufactured body parts of creatures like Bigfoot or the Chupacabra have bamboozled a truly amazing number of "scientists". The second is the circus, where a cottage industry developed around the manufacture and exhibition of improbable beasts. Somewhere between the two are those sources that look at the historical manufacture of fantastic creatures. Sadly, there's precious little documentation of gaffed animals beyond the 14th century, but there is one account from the 13th century that stands out. It comes to us from The Travels of Marco Polo. After describing the kingdom of Basma and it's unicorn (almost certainly a rhinoceros) he spills the beans on the real source of those "pygmy" bodies flowing into Europe. I may tell you moreover that when people bring home pygmies which they allege to come from India, 'tis all a lie and a cheat. For those little men, as they call them, are manufactured on this Island, and I will tell you how. You see there is on the Island a kind of monkey which is very small, and has a face just like a man's. They take these, and pluck out all the hair except the hair of the beard and on the breast, and then they dry them and stuff them and daub them with saffron and other things until they look like men. But you see it is all a cheat; for nowhere in India nor anywhere else in the world were there ever men seen so small as these pretended pygmies. What's striking about this passage is how it presages what's to come. A few hundred years down the line those pygmy bodies would be passé. But the market would come alive again when craftsman grafted the tail of a fish to those same monkey bodies and created the Fiji Mermaid. Only to see fake versions of their fake mermaids show up when someone realized you could save a lot of trouble by crafting the thing from wood and paper mache right from the start. It's a glorious example of meta-fraud. David G brings us a look at aging statuary using oil paints and colored powders. 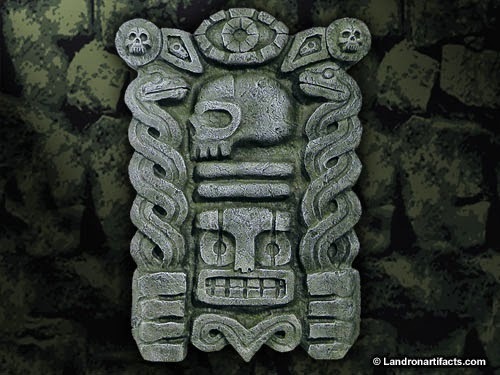 It would come in handy for anyone looking to distress any kind of artifacts. What you must remember is that the important part is to make sure the glaze is brushed in every little cranny; You don’t have to worry about how well covered the flat surfaces are. That doesn’t matter. It doesn’t matter because you’re gonna rub it off anyways, slowly but surely, with a soft cloth. Do not rub so hard as to remove the paint from the recesses; Only remove it from the flat, elevated surfaces. The deeper the area, the more paint you wanna let settle down. 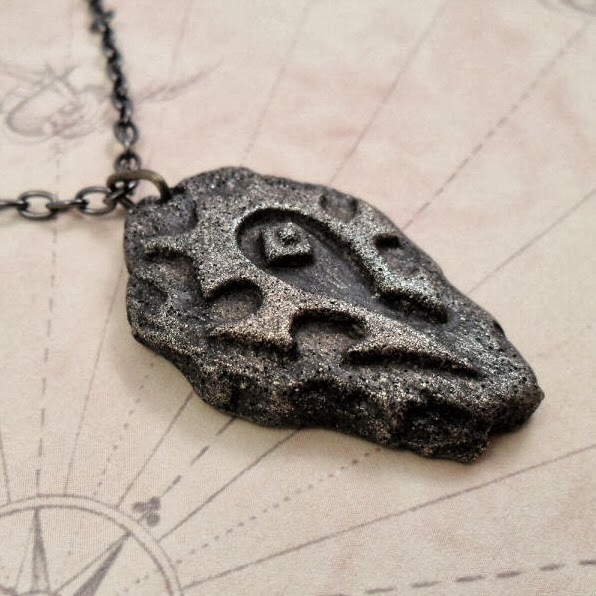 VonMeer brings us this Amulet of Dagon, an artifact from the Innsmouth raid. Crafted from antler, ivory, and Sculpey. 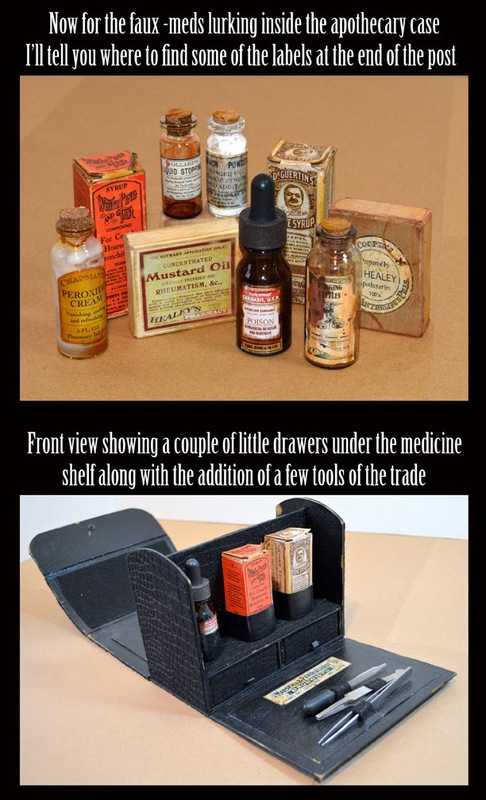 Put off by the $450 price of a vintage apothecary case, M.J. Girling decided to make her own. The results, including a large selection of reproduction medicines, are outstanding. 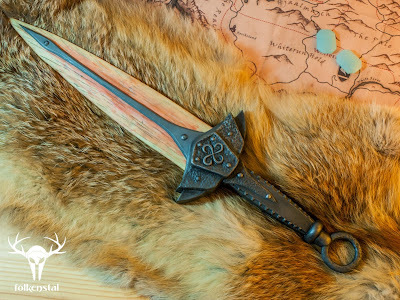 Folkenstal brings us another Skyrim replica. This time it's the Dragonbone Dagger. 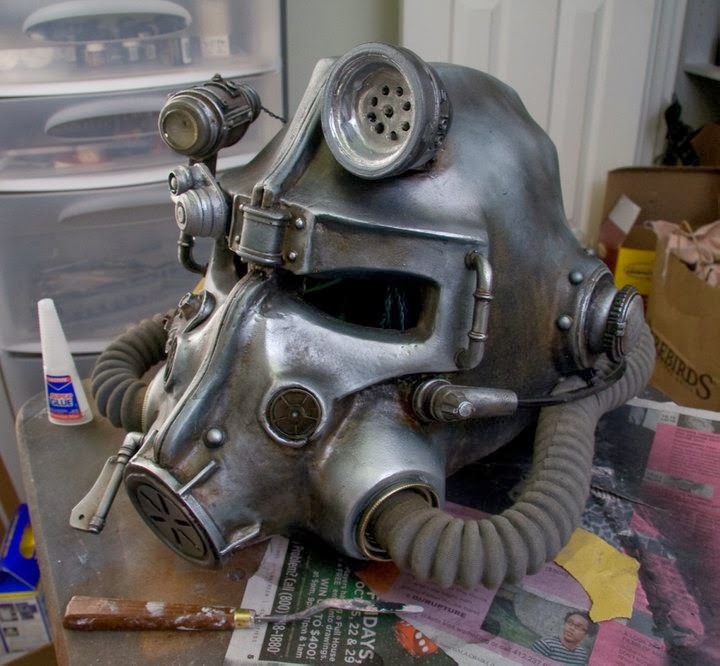 His build log includes every single step of the process, from converting game images into real world measurements to the final finishing of the resin casting. 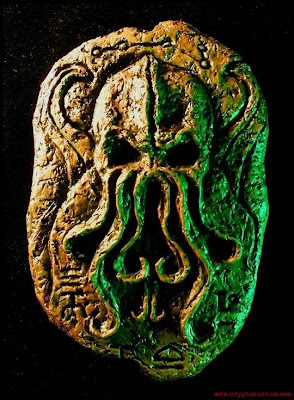 Jason McKittrick, well-known acolyte of Nyarlathotep, brings us the Talisman of Yig. It's another one of his short run projects for the month of October. 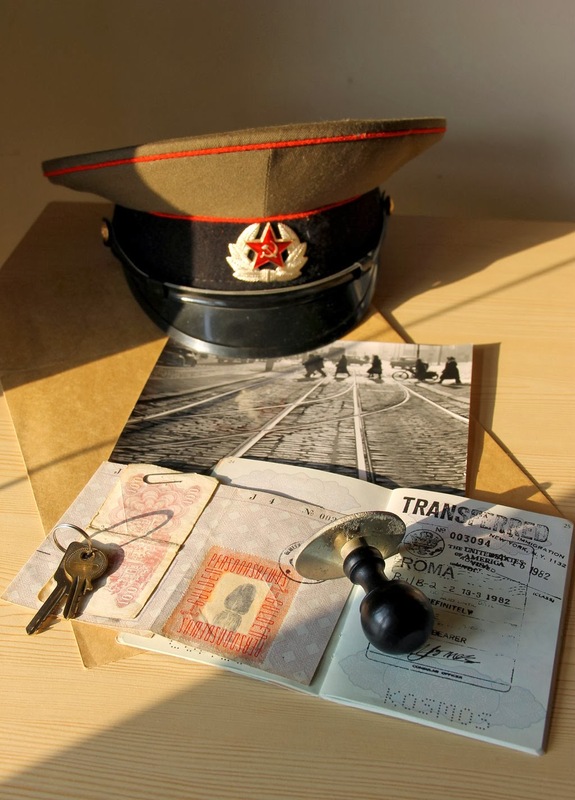 Josua-Mozes brings us this bureaucratic prop tableau. The faux passport is a great piece of work. The always useful David Rumsey Map Collection has a neat map of San Francisco's Chinatown from 1885 available as an ultra-high resolution download. It includes helpful notations from the town fathers on locations where opium, gambling, and prostitution were known to be active. There's more than a whiff of casual racism about it, but it's an awesome resource for a pulp game. As an aside, I've been doing quite a bit of reading about the history of sideshow gaffs. Most of that material is contained in books about traveling shows and the circus, and it's amazing how pervasive racism was in that environment. At the same time, it's a very strange, uniquely American brand of racism that schizophrenically alternates between xenophobia and xenophilia for various groups. Artist John Genova brings us this well done vampire hunting kit. 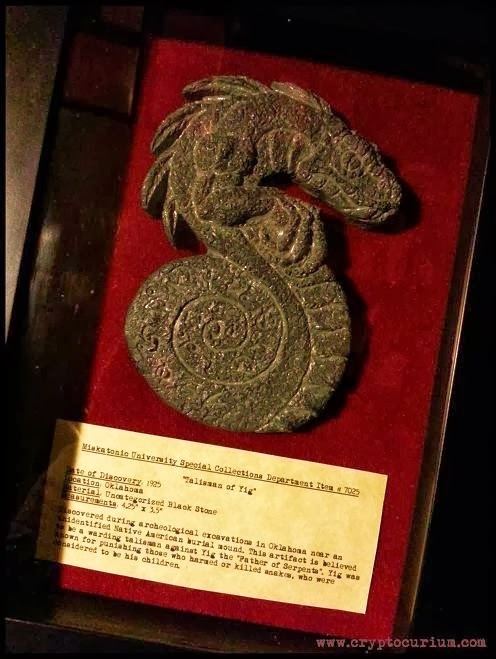 Nick Storm was kind enough to send over a link to this nifty Twin Serpent Guardian from Landron Artifacts. There's a nicely detailed making of as well. 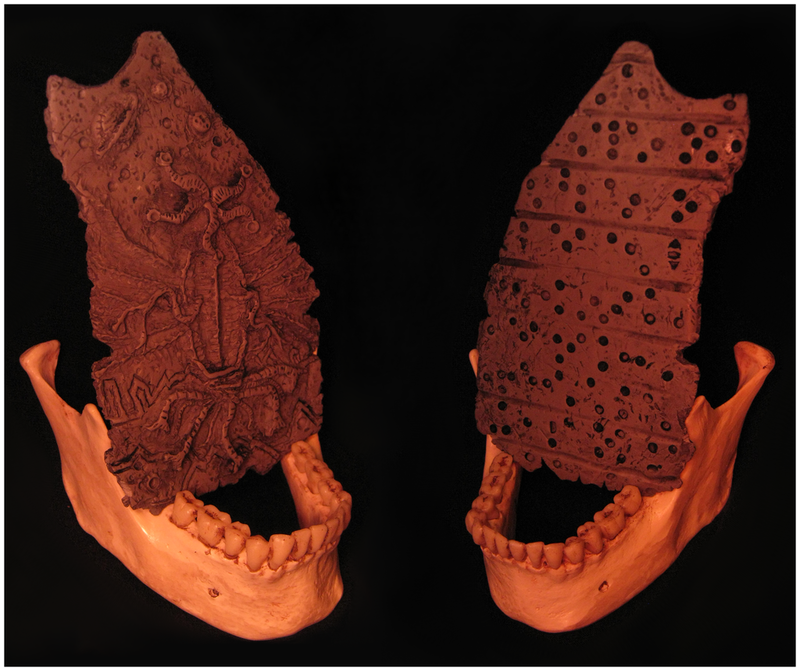 This is another iteration of the "Innsmouth Tooth" project I first did back in 2009. I'm really happy with how it came out, but I wasted a huge amount of time thanks to my smug cleverness. I wanted a more realistic depiction of an aged tooth, so I tried to think of natural materials that would lend themselves to the project and eventually settled on antler. At the time I assumed I'd just have to reshape the point of an antler tip with a Dremel tool, slap some stain on it, and call it a day. A quick and easy project that I could finish in an afternoon. 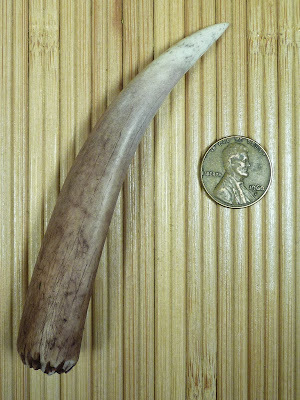 First off, finding an antler tip that was actually tooth-shaped was surprisingly hard. Out of the fifteen pieces of antler I went through only one was even close to having the proper smooth curve. 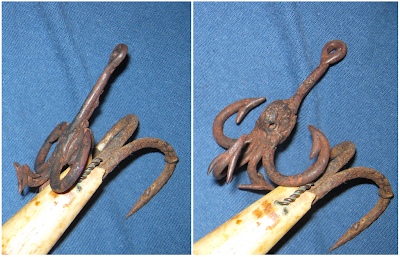 Most of the points were actually blade shaped in profile, not round. The one that did have the right shape had a very blunt end that needed to be honed down to a proper point. That's when I encountered the second problem- antler is hard. There's a reason our ancestors used this stuff for tools. 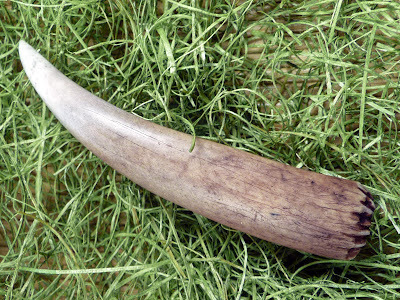 If it's been sitting in the sun for a few months it can get soft and chalky, but antler that's protected from light and weather is amazingly tough stuff. That quick little sanding job to give it a point ended up taking close to an hour with a Dremel equipped with a sanding drum. A cutoff wheel made quick work of the broken root end. Oh, one other thing. Make sure you're wearing a respirator or at least a tight dust mask if you're working antler. 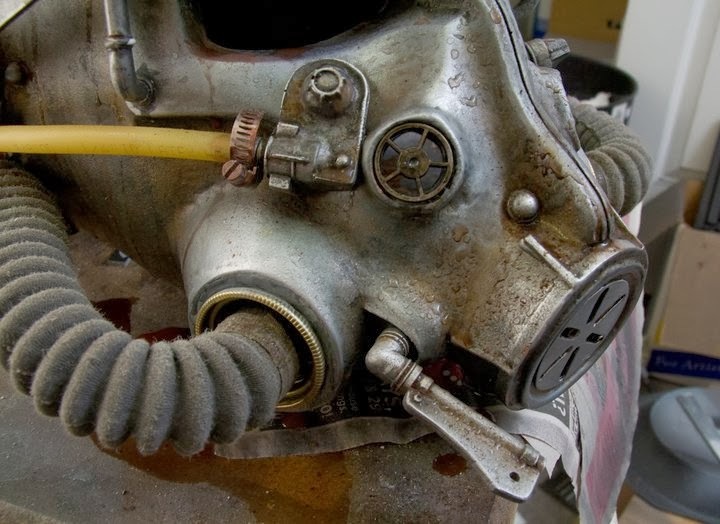 The process stinks to high heaven and the resulting powder is terrible for your lungs and breathing passages. So after all that it was time to apply the stain and glory in the beautiful natural textures of my faux tooth. That's when I discovered antler isn't absorbent and it will only take surface color, not penetrating stain. It looked like a brown lump of wood with no notable surface texture at all. This is when I realized that using antler was a stupid idea, because I now had to go back and do everything I would have done to a "tooth" made from Sculpey to get a decent result. That meant sanding down the entire thing to give it some surface bite to take paint, and scraping down the root end with a wire brush to get those nice age cracks. 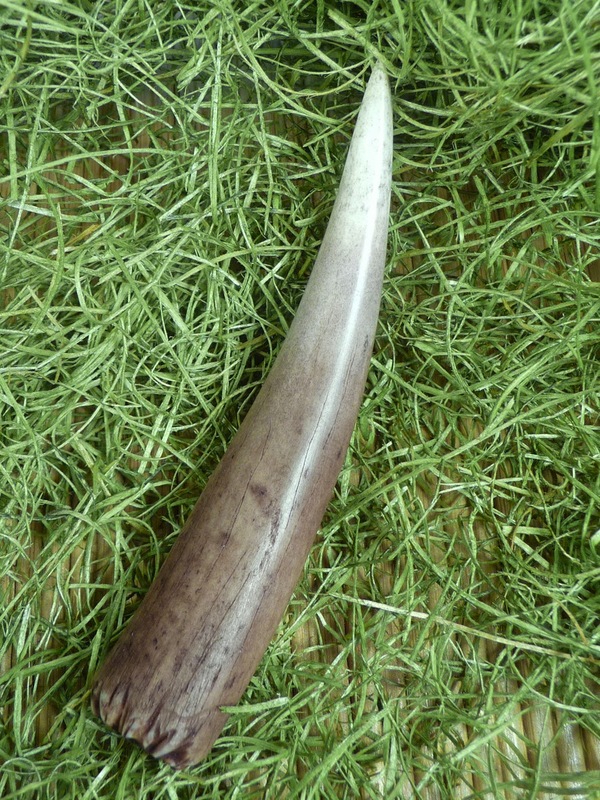 Did I mention that antler is hard? What would have taken a few minutes with a baked Sculpey tooth ended up taking another hour. But by this time I hated the thing so much that I was hell-bent on salvaging something out of the whole misbegotten effort. Once the texturing was done I gave the whole thing a light wash of black acrylic paint followed by walnut brown and burnt umber along the base. 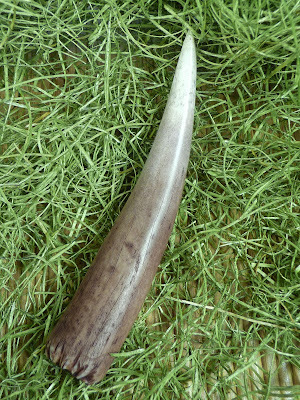 A light sanding brought out the white of the tip. After all that it still didn't have the sheen of tooth enamel, so I ended up burnishing the whole thing with a steel rod- exactly what I would have done with a Sculpey tooth. Except a tooth made out of Sculpey would have been done in an hour or two, while this thing ended up taking an entire day. Ultimately, it came out looking really good, but the effort required to use real antler was all out of proportion to the results. 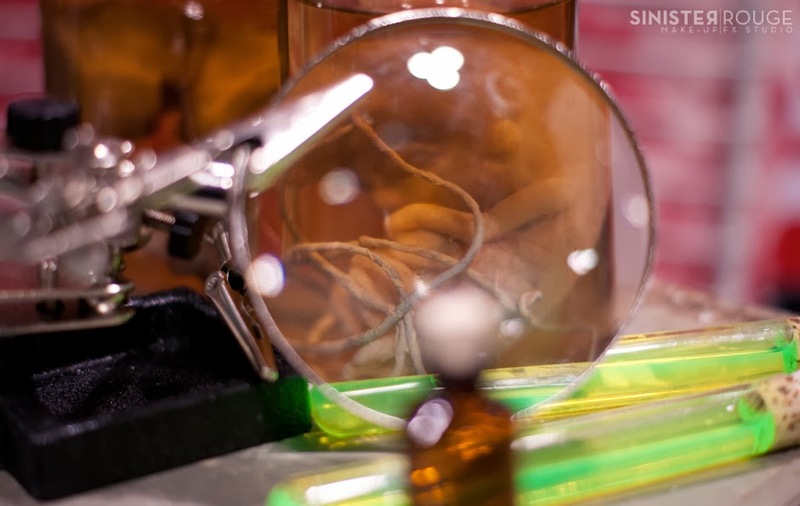 Sinister Rouge FX brings us some classic mad science. 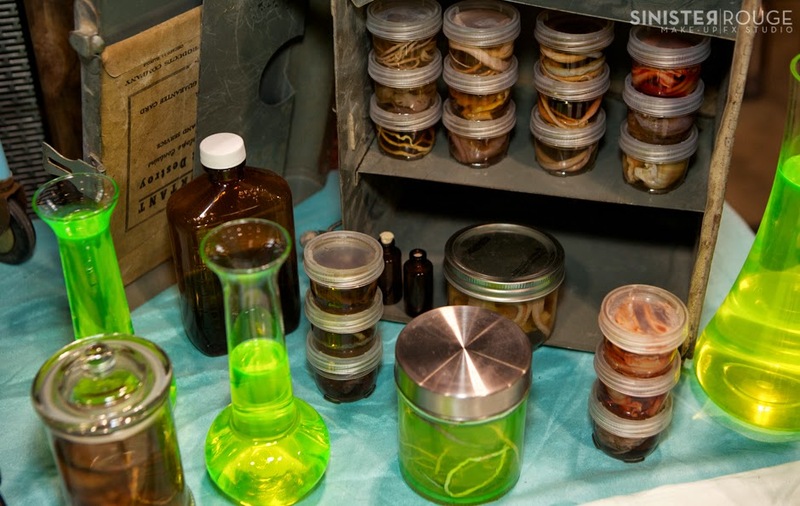 This is their con display, and it features some great preserved specimens.